Editor's note: An earlier version of this story contained an incorrect figure for annual private vehicle sales in the U.S., Europe, China and India. The correct figure is 67 million units. DETROIT -- Global vehicle sales will decline over the next two decades as consumers embrace on-demand ride services such as Uber, according to a study by IHS Markit. 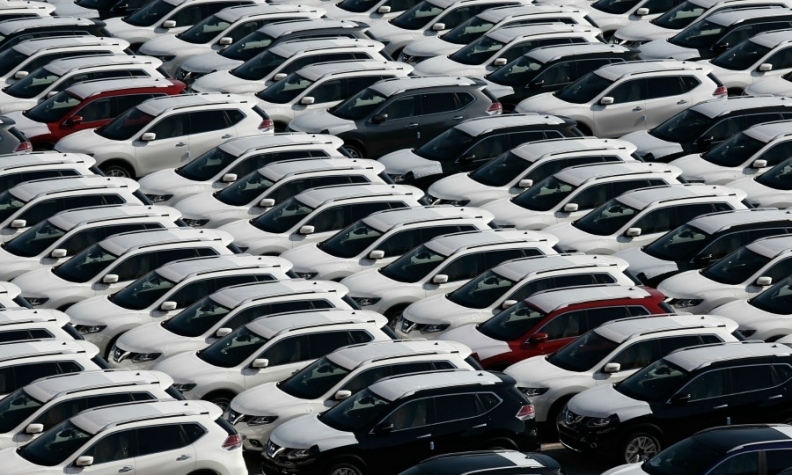 Annual private vehicle sales in the U.S., Europe, China and India will decline over the next 23 years to 54 million in 2040, the study projected. About 67 million vehicles a year are sold currently in those regions. Another finding from the study was that more than 80 percent of the vehicles sold worldwide in 2040 will still use some form of petroleum-fueled combustion engine. According to IHS Markit, all-electric vehicles will account for about 19 percent of sales by 2040. This compares with an estimated 14 percent of production by 2030 in a forecast by Boston Consulting Group on Nov. 2. Plug-in hybrids will account for another 14 percent of sales in 2040, IHS Markit forecast. Cars powered only by gasoline or diesel will make up about 62 percent of new-car sales in the study's four markets, down from 98 percent last year. "Consumers are starting to embrace" the advanced technologies in electric and self-driving vehicles, said Tom De Vleesschauwer, IHS Markit's transport and mobility practice leader. Consumers will take a bigger interest in electric cars as their costs drop, driven by cheaper battery packs. Right now, battery packs costs about $200 per kilowatt hour, Vleesschauwer said. Carmakers need to get costs down to about $100 per kilowatt hour to be competitive with a gasoline-powered car, the study said, forecasting price parity in the 2030s. While the adoption of electric vehicles is being driven in part by technology advances and government policy, "the part that's most consumer-driven is ride hailing," the on-demand service offered by such startups as Uber and China's Didi Chuxing, according to Daniel Yergin, IHS vice chairman. "A great 'automotive paradox' -- where more travel via car than ever, but fewer cars will be needed by individuals -- will be a defining quality of the new automotive future," Yergin said. "The shift is just beginning." The mobility-as-a-service industry will itself buy more than 10 million cars in 2040 in the four markets examined in the study compared to about 300,000 in 2017, said IHS Markit, which provides economic forecasts and data to the global energy and automotive markets. Yergin said the firm was "surprised when we saw (oil) demand increasing rather than going down. Yergin noted that cars only account for a third of oil demand. The study's authors expect 43 million barrels a day of new oil production will need to be brought into development by 2040 as demand rises and existing fields decline naturally.